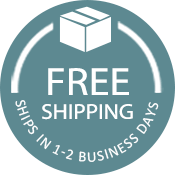 The W Silver Product’s (WSP) F71002 Steel Bed Support is the perfect new or replacement rail systems and fit 2 different bed sizes; King and queen size beds that have wood side rails that hook into a wooden headboard and hook in foot board. The F71002 metal bed frame includes 2 heavy duty steel side rails, two hardened steel cross support bar, one beam running the bed’s length. Lastly it includes 6 long lasting legs that can easily support the weight of a mattress set, the bed, and the entire family when the little ones come looking for some support from mom and dad when a storm pops up. Legs adjust to fit more beds. Why would I need a F71002 Rail System? Do you have a Queen, Eastern King size mattress set and bed? Maybe the sides have cracked – or even worse split and broke? 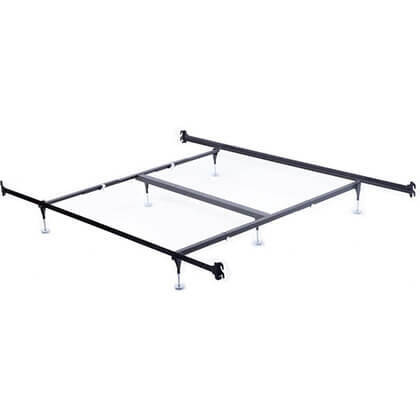 The F71002 bed rail system in most cases can be used to replace your existing bed side frames, rails, and center support. The great thing is they are beefed up and loaded with extra middle support not found with ordinary railing systems. They are connected on each side this keeps the side railings from spreading, bending or bowing. W Silver’s rail system is a patented, slat-less hook rail bed frame and evenly distributes the boxspring for perfect bed support. 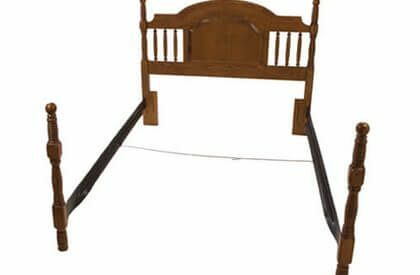 The rails hook into virtually any bed with a head board and footboard. Be sure to test the hooks for proper fit by printing off our down hook template. W. Silver’s bed rails are built and shaped from 1 1/2 wide angle iron that is made from high carbon steel, This provides the support and strength required by every mattress making company. The down hooks have flattened ends that allow just enough flex in the sides for a snug and safe fit. The F71002 has an L shape design of angle iron for even support along the entire length of your boxspring making the need for wooden slats unnecessary unless your down hook slots are spaced more than 61″ apart. 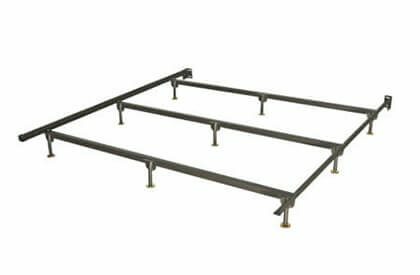 These replacement steel rails also have 2 additional needed cross arms that open up and span the bed’s width at the head and also at the foot end. When connected they will also keeping the side rails from spreading. There is also a center support running head to toe down the middle for even more needed middle support. There is a total of 6 feet. 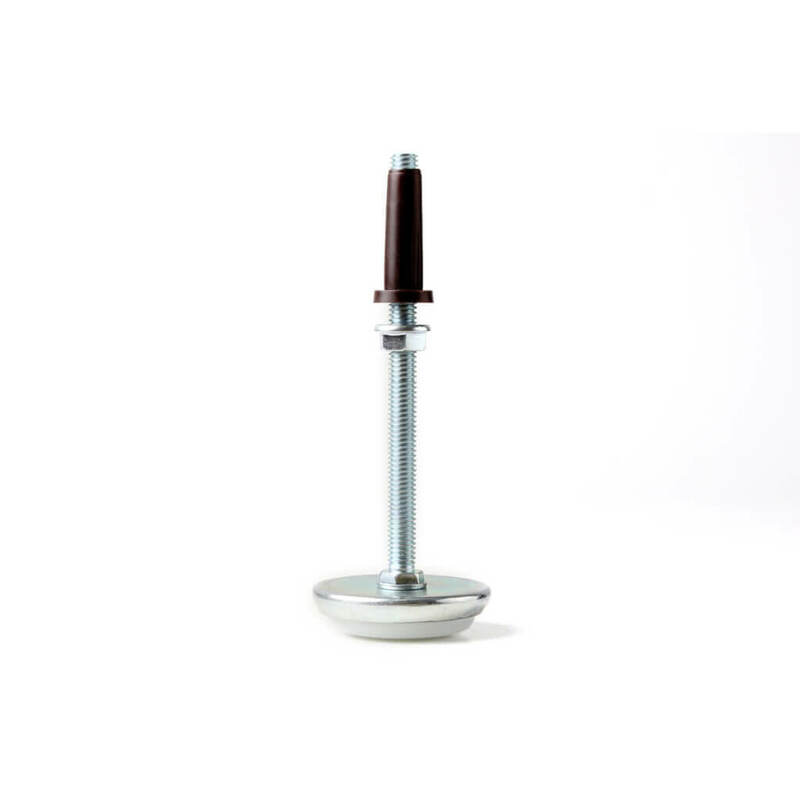 The adjustable glide feet are threaded and can be positioned for the proper leveling to support a wide variety of boxsprings, mattresses, and beds with a sturdy solid hook in connection. The rails measure approximately 83″ long leaving plenty of space to get your hands between the mattress at the headboard and foot board ends while making it. Check out the 63CSWB Queen Bed Frame that can fit a queen mattress, but can also withstand the weight of a waterbed! Do not slide bed when moving it can cause damage to the bed frame. This is a very high quality and beefy frame, and the claws fot both headboard and footboard, the only issue I found was that the headboard and footboards were not rigidly attached when done and would wobble a bit. However, I saw that there were two holes in the face of the frame that I was able to use to firmly attached the headboard and footboard to the frame that produced a very rigid attachment. Just required getting the right size panhead screws and drilling the wood to the correct size. I thought that this could be included in the instructions as a option, as I suspect others might not come up with the idea. by the way, I was impressed with how quickly the frame shipped and arrived (2 to 3 days after ordering), in time for me to put it together before our guest arrived. Bed frame came really fast. Was called to make sure my headboard and footboard fit. Was really easy to set instructions were on point ,one of the hooks was a little bent but I fixed it. Overall I’m happy with it so far.